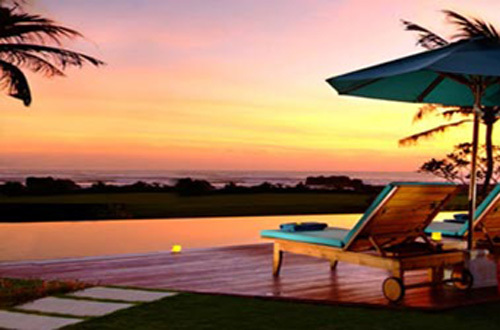 Villa Tanju Bali is a luxurious 5 bedroom beach front villasinbali located at Mengening Beach on Canggu area. Villas Tanju Bali is comprised of a series of pavilions, leisurely spread throughout 2,400 square metres of tropical gardens, complete with a stunning 15 x 4.5 metre infinity-edge swimming pool, lotus ponds and restful water features. The simple application of timber, terrazzo, natural colours, fabrics and local materials, such as the alang-alang grass used in the construction of the roofs, is consistent throughout the property. The rugged beach is just a few metres away and the glorious views take in the distant volcanoes, dramatic coastline and neighbouring Hindu sea temple of Pura Bata Ngandang, perched on a rocky outcrop and lashed by the waves of the Indian Ocean. The stunning 9 meter x 6 meter living pavilion with glass bifold doors and separate dining pavilion have been designed for relaxation and entertainment and provide optimum enjoyment of the wonderful ocean, river and unforgettable sunset views. The pavilions with their high natural alang alang grass ceiling, the tall supporting coconut columns and the cool cream terrazzo paved floors are the very essence of tropical living. Overhead ceiling fans and gentle sea breezes keep everyone cool and the ample lounge area seating assures that there is room for everyone to relax. The lounge has a music system with surround sound speakers in the ceiling. The dining pavilion adjoins the open kitchen and both share stunning ocean views. A separate air -conditioned indoor study has a Television unit complete with VCD or DVD and Video systems. The grounds are beautifully grassed and maintained. The wonderful 15 meter long swimming pool is lined with green stone with a white Palimanan stone surround. A swim in the pool, a surf at one of Bali’s most popular surf beaches, a beach walk, a bike ride up to the village and its surrounds or a quiet fish at the rock pools all make for an unforgettable holiday. The Villa has 4 Air-conditioned bedrooms, all with en-suite bathrooms. The villa has been designed with a master on ground level, two guest rooms with King-size and Twin bed in another building plus 1 king-size bedroom upstairs connecting with the study. All the bedrooms have ocean views with large glass sliding doors also with split air conditioning units as well as overhead ceiling fans. The bedrooms feature built in wardrobes and ensuite Bathrooms. All bedrooms have good quality curtains and have been tastefully furnished with collected antique furniture and artifacts.